I stumbled across a photograph of a Norton motorcycle 'John Player Special' on the web tonight and it sent me on a nostalgic trip down memory lane. 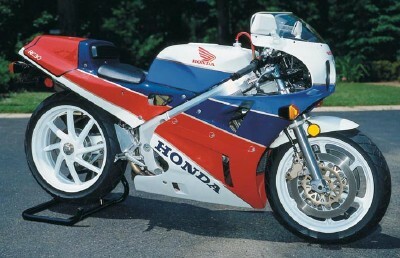 There was a time, over twenty years ago when these wankel-engined beasts dominated motorcycle F1 racing. 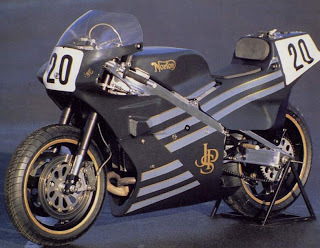 This was a period in my life, before I developed a passion for flying, that I had a very pleasant sideline road-testing 'Superbikes,' for a number of the country's most popular motorcycle publications, such as Performance Bike and Motorcycle International. I remember being loaned the only available road-bike in the country and being instructed by a worried editor on no-account to bend or crash it before taking it out along the A3 accompanied by a photographer. With Pirelli racing tyres fitted we went down to Wimbledon as the tennis was on, for some shots outside the All England Lawn Tennis Club, where we got some very pretty girls to pose on it and then a little further on to Tippets Corner roundabout to catch the bike tucked right over as it attacked the bend. As developments in engine and composite technology made remarkable strides at the beginning of the nineties, another racing great bike that appeared around the same time was the 750cc Honda RC30, which was unbeatable for a while on the track. I actually bought one of the few available when the road-going model appeared. It had a very radical seating position which felt as if one was perched on a bar stool. As I lived in London at the time, I did the original road test down to Thanet as an excuse to visit my mother and can recall a couple of lads knocking at the front door that afternoon in Westgate, asking if they could look at the bike in the drive as they had never seen one off the track. Other memorable machines were Yamaha's oval piston 'OW01' , Yamaha's VMAX, Suzuki's 750RR, which was stolen from right outside my front door, of street, one night and of course the Kawasaki beast of a ZZR1100 which had me up to 155 mph on a straight-run test. Today, the roads are so much busier and far more dangerous than ever before and if any young man told me he planned to buy a motorcycle, as much as I love them, I would do my very best to put the idea out of his mind. Of all the people I've known over the years, who shared the same passion for motorcycling, possibly more than half are dead, paralysed or gravely injured, normally as a consequence of of either careless accidents or encounters with careless motorists. Looking back however, those 'Top Gear' days before the arrival of speed cameras and endless traffic jams on the M25 were great fun and while today, it costs me an extortionate £27.00 to fill-up my BMW bike, then it would only have been a 'tenner', tops!